Discussion in 'Z3 Roadster & Coupé' started by Joolz, Aug 15, 2014. I am going to change my gearbox oil as the shift is a bit clunky when the car is cold but gets smoother as she warms up. While I am at it, I want to change the diff oil too. 1) What gearbox oil do you recommend (2.8 with manual transmission)? 2) Does my 2.8 have an LSD? 3) What diff oil do you recommend (based on answer to question 2)? 4) Are these relatively simple jobs? Easy enough joolz, only thing you might need is a syringe to put the oil back in. I know that you can squeeze the soft plastic bottles which oil comes in but be warned, it's a messy job. That apart no problem. Have you watched the recent thread re gear oil in a 3.0 ? It can get complicated, if you can see a sticker on the gearbox, you need to know the colour of the sticker and there will probably be some oil type info too. On my 2.0 Auto , green sticker, Dexron 3 oil. Simples. You might want to use BMW's recommendations for the transmission fluid. They recommend a viscosity of around 7.7 for good shifting. There are several fluids that meet that spec, such as the commonly available Dexron VI, as well as Pentosin MTF 2, BMW MTF-LT-2 which is made by Pentosin, Royal Purple Synchromax, or Red Line D4 ATF. It takes a cheap finger pump to fill the transmission. 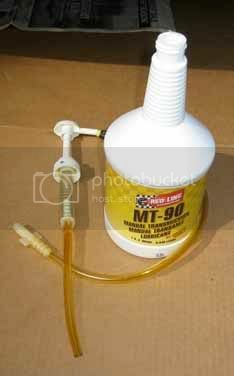 I use one that was made for filling the lower gearbox of an outboard motor, and screws on top of the fluid container. If you go to your local dealer with your reg no or VIN, they can give you a print-out of your diff spec and oils. Opie Oils are a good supplier and will give you good recommendations. To get diff plugs out you need a hex drive - they may be a bit reluctant so take fill out first! You should replace aluminium crush washers - I bought 2 new plugs including seals for ~£10 from dealer. Gearbox fill is a bit messy as already mentioned. I filled my diff using a funnel and an old length of dishwasher fill hose - simples just stand at back and pour. This is after talking to, among other people, Castrol themselves. "Fully synthetic manual gearbox oil... offering superior low temperature shiftability, especially suitable for BMW vehicles." Its low 7.29 viscosity would assure easy shifting. It's lower than the 7.7 that the usual BMW fluids have, and much lower than the heavy gear oils that people tend to put in manual transmissions.